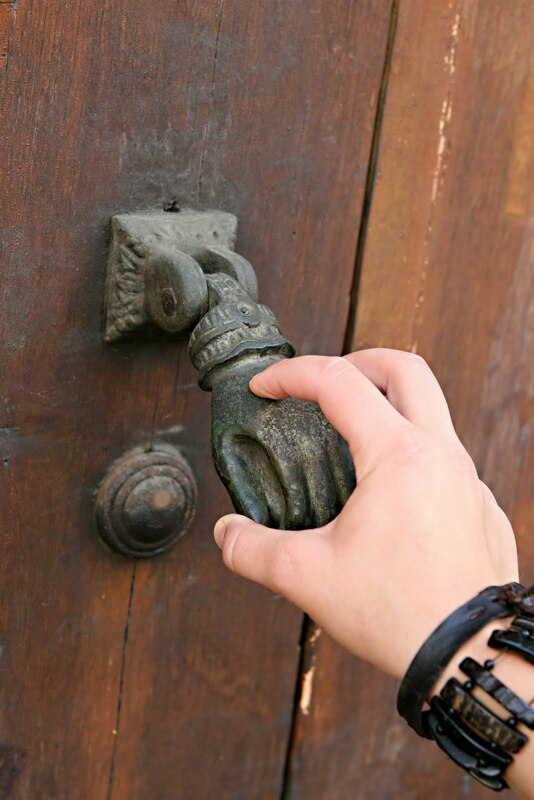 IRL*in real life with Jamie Jo: Knock, Knock. Who's There? Thwarted. Repeatedly. Every time I turn around, Dad seems to be saying, “Oh, no you don’t.” Again I am out of control. He’s calling the shots. This morning at breakfast my ds told an old knock-knock joke that I once told a friend, thinking she might see herself in it, but she didn’t. Today it hit dangerously close to home. Ack. I never thought this was particularly my problem, but suddenly nothing is going my way, and I realize again that I must lay down the reins all day long, every day of my life. And you know what? When I do, I invariably find that God’s ways are better than my original plans. The weekend retreat was lovely, and the messages were exactly what I needed. It was only behind the scenes that any power struggles occurred between the Trail Guide and myself. Day one, we had planned a lovely 5-plus hour drive to the retreat center, just our family and the conference speaker and his wife, who have been dear friends for over twenty years. Then dh informed me we were caravanning with another family. Then the family informed us they were taking another family in their van, and yet a third vehicle was following them with another family of six. First stop was McDonald’s. I thought we would drive through very quickly before leaving the city and take some burgers for lunch. Thwarted. It wasn’t yet noon, so all we could get was breakfast. Then the three other families decided they would go into McDonald’s to order. Forty minutes later we were finally on the road. My plan was to arrive in plenty of time to get registered and settled before the first session, but due to a string of complications (road work, long potty stops, etc. ), our 5-plus hour trip took a full 8 hours. It wasn’t bad, mind you, just not what I had envisioned. The poor speaker had to literally climb out of the car and walk straight to the podium and start speaking. And so it went for the rest of the weekend. It’s like we remind the newbie missionaries, “Not bad, just different.” That’s my new mantra of the week. Surely I will soon stop trying to micromanage and allow the King of the universe to dictate what each day will hold. I find that I like to have some control over events, and even though I'm learning flexibility, I still have a long way to go! Sometimes it seems better to have no expectations of how things will turn out, then there are no frustrations or disappointments. Exactly! Better to have no expectations. I just noticed that I used "ACK" twice in this post. Oh, well. I guess it's been a double ack sort of week. Even after I wrote this I just went to take a visitor to the artisans market, telling the kids to continue with schoolwork, intending to be back in an hour and a half or so. Ha! Three and a half hours later I return, too pooped to teach. Sympathies from another "control freak"! Like the other Karen, I'm learning to be flexible, and learning that sometimes the unplanned things are just what God wanted, but it's not an easy lesson to learn. Try adding perfectionism to the pot! Eeeeek. Praise God for his grace in working in us and through us despite what we consider our shortcomings. From one SERIOUS control freak to another... I say, Amen! and lay it down, my friend! Lay it down! I hear you here and continue to walk in my daily, open-handed-clinched fist-dance before the Lord. May He continue to teach me (and you) to trust and release. This is a great reminder for me. I went to a conference two weeks ago and came back wanting to get read of my "CONTROL" tendencies, asking God to change me! I've had plenty of opportunity to TRY to sit back and let others have their way since I've returned. (sometimes I'm gritting my teeth to let go and sometimes I'm trying to get control myself!!!) Holy Spirit have your way! "Not bad, just different" is a GREAT motto! Hmm, one would think compliant types like myself have it easier? Well, we should - as long as we don't bottle it up inside and explode at inopportune times. Which is often what happens. So your advice is sound for both types: let the King dictate. Both inside and out. SERIOUS control freak, Stephanie? I'd rather think of myself as a quiet compliant type like Ilona, but you are likely correct. Sad, isn't it? Karen, I've never thought of myself as a perfectionist by a long shot, but that would make things even more difficult, I'm sure. Olive, our teeth may be worn flat by the time we learn our lessons, but it will be worth it all. Apparently the King's plan did not include an actual baby to see when I go see the granddaughter who still isn't born. Maybe the plan will be that I go in time for the actual birth! That would be great. I know, Stephanie. It's just that the shoe was fitting a bit snugly right then. How's Thanksgiving Looking for You This Year? Do You Have the Gift of Giving Gifts?